As I am sitting in a hospital interpreting for a Deaf client, I received a phone call from the sister of another Deaf patient in another hospital. They are asking me for advise on how to get a live interpreter instead of VRI (Video Remote Interpreting). This is why I decided to write this article. VRI or (video remote interpreting) is a computer, laptop, or ipad that is set up with a program that is able to do a video call to an interpreter in another location. The patient is able to see the doctor and the nurse and can help with a conversation. This can be done with little effort in many occasions. However it is not always appropriate and many times it doesn't work as smoothly as it sounds. Not every situation is conducive for VRI. A deaf client comes into the emergency room and asks that they would get an interpreter to help with communication. The staff have been informed to use the VRI to save the hospital money from bringing in a live interpreter. Its been three months since the last deaf patient came to the emergency room and the first thing is to find where the video device was left. Twenty minutes later they find it and they plug it in. They find out that the operating system has been updated in the last month so they have to wait for the computer to update the operating system. When that has finished they find out that the software has been updated to keep up with the operating update. Now the nurse tries to log in but it has been months since they have used it and have to figure out how to connect with the interpreter. Finally they have connected with the interpreter only to find out that the internet connection is very slow and the video is so blurry that they can not understand the interpreter. Now they have to call a live interpreter and wait another hour waiting for the interpreter to arrive. The Deaf patient gets admitted into a room and they tell the interpreter they are no longer needed they will get the IT department to get the VRI working. The deaf patient lays in bed with the VRI next to them on a stand or a table. The nurse comes in and is swamped with other patients and doesn't have the time to figure out how to use the VRI and tries to speak louder making exaggerated mouth movements hoping the deaf patient will understand better. They don't and try writing back and forth, however English is not the first language of the Deaf patient and this does not work very well. Later the doctor walks in and starts talking unaware that the patient is deaf. When they realize the patient is Deaf they start talking to the nurse as the Deaf patient watches not understanding whats going on. The next couple of days that the Deaf patient experiences many people walking in trying to communicate without success. Different doctors, nurses, aides, respiratory, therapist, occupational therapist, social workers and clergy men all trying the best they can. Smiling and nodding blah, blah, blah. Transport comes and takes them for test, xrays, cat scans, not knowing why or whats going on? The deaf person gets frustrated and sues the hospital for not providing communication, and not following the ADA (American's with Disability Act) Bethesda Hospital in West Palm beach Florida was just sued for forcing Deaf patients to use VRI. What are the alternatives of using VRI? You could call in an ASL Sign Language Interpreter as soon as the deaf person comes in and then when the patient gets admitted into a room you could schedule an interpreter there 24 hours a day until they are discharged. This can add up to thousands of dollars paying for an interpreter. When the Deaf patient comes in, ask if they are familiar with VRI and are OK using VRI. 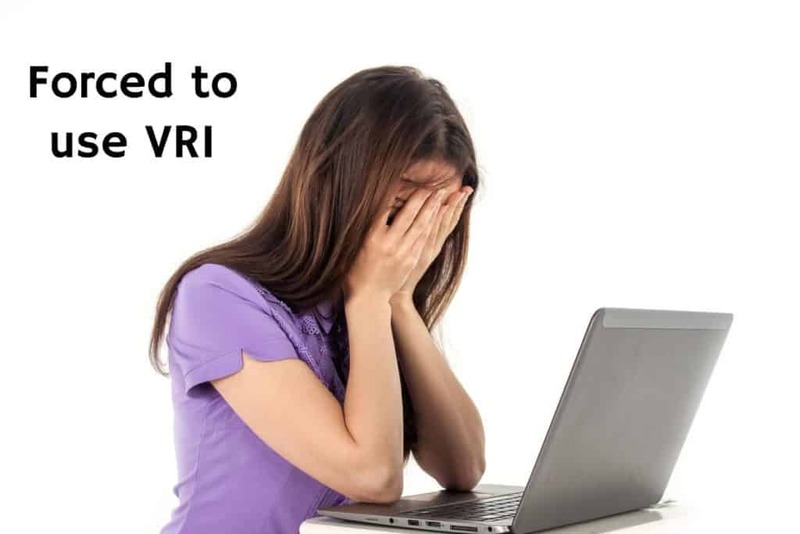 If it is not easy to determine if they are OK or not with VRI then start with VRI to get name, address and any information you can. At the same time call the Sign Language Agency to send in an interpreter to evaluate the deaf patient. Once the interpreter has arrived they can confirm the information that has already been acquired. Things the interpreter is looking for when accessing the deaf patient. From here the interpreter and the nursing staff should be communicating with each other. Finding out which solution is best for this patient. Each situation is very different. If there are test that are going to be going on, then the VRI does not travel very well. If the patient reads and rights well and is comfortable writing back and forth that might be OK. If its not a serious situation and the patient will be sleeping all night, then you might be able to let the interpreter go and have another interpreter come back in the morning for test or doctors rounds.